Artwork details: gouache and gold leaf on paper, 16.8 x 10.7 inches (43 x 27 cm), 2010. 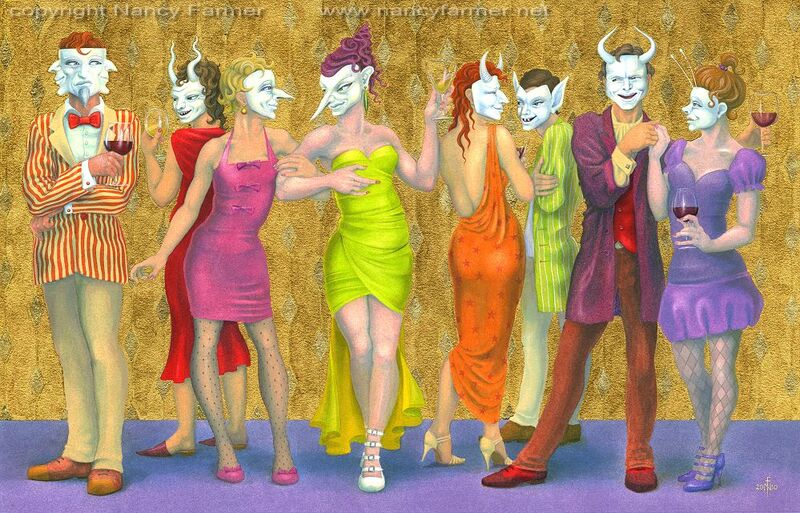 This is the second Masquerade painting of 2010 - the first one was The Guilty Party. It seemed I simply hand not had enough of putting in gold leaf backgrounds, labour-intensive though it is, so I did another one. Plus I sold The Guilty Party very soon after painting it and I wanted another shiny picture on the wall. So here is another set of masked figures at something of a drinks party. Unlike the first painting this lot do not have murder weapons, but you still wouldn't want to trust them. It's the way their masks are smiling that makes me suspicious... of course they are up to something. If you'd like to know more about how this painting was done, you can see some step-by-step images of how this painting developed in a facebook album here. And for a lot more information have a look at the painting materials section on this website, (currently a little hidden under 'info').